Armstrong's words "That is one small step for (a) man, one giant leap for mankind," spoken on July 20, 1969, as he became the first person ever to step onto another planetary body, instantly became a part of history. Those few words from the Sea of Tranquility were the climactic fulfillment of the efforts and hopes of millions of people and the expenditure of billions of dollars. A plaque on one of the lander's legs that concluded "We came in peace for all mankind," further emphasized that Armstrong and fellow astronaut Edwin "Buzz" Aldrin were there as representatives of all humans. In a 2001 oral history interview, Armstrong credited those behind the scenes for the mission's success: "when you have hundreds of thousands of people all doing their job a little better than they have to, you get an improvement in performance. And that's the only reason we could have pulled this whole thing off." Armstrong is survived by his wife, two sons, a stepson, a stepdaughter, 10 grandchildren, and a brother and sister. 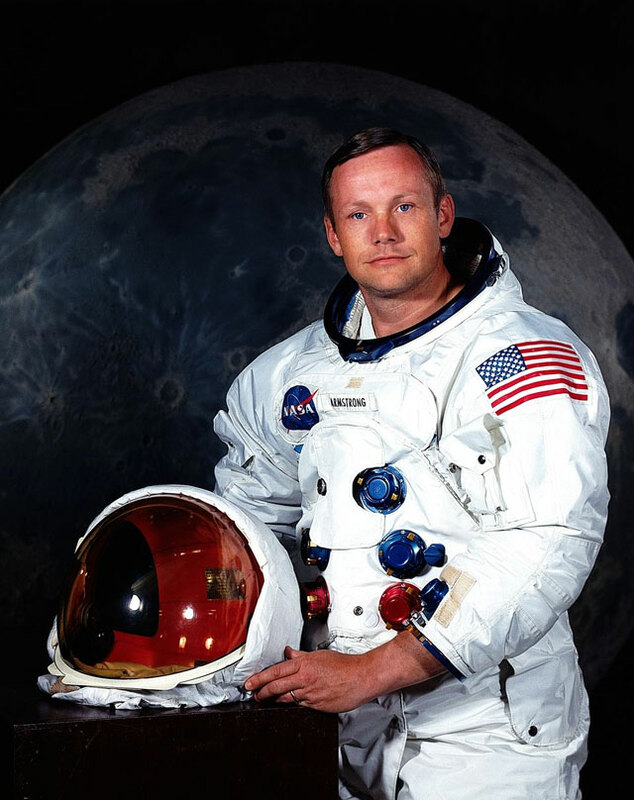 "Neil Armstrong was a hero not just of his time, but of all time," President Barack Obama said via Twitter. "Thank you, Neil, for showing us the power of one small step." "Neil Armstrong was also a reluctant American hero who always believed he was just doing his job. He served his Nation proudly, as a navy fighter pilot, test pilot, and astronaut. He also found success back home in his native Ohio in business and academia, and became a community leader in Cincinnati. 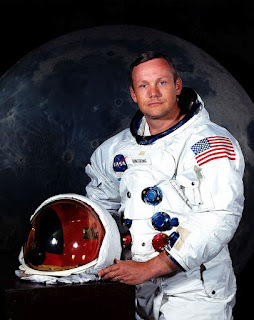 Neil A. Armstrong was born Aug. 5, 1930, in Wapakoneta, Ohio. He earned an aeronautical engineering degree from Purdue University and a master's in aerospace engineering from the University of Southern California. He was a naval aviator from 1949 to 1952. During the Korean War he flew 78 combat missions. In 1955 he joined the National Advisory Committee for Aeronautics (NACA), NASA's predecessor, as a research pilot at Lewis Laboratory in Cleveland. Armstrong later transferred to NACA's High Speed Flight Research Station at Edwards AFB, Calif. As project pilot, he was in the forefront of the development of many high-speed aircraft, including the X-15, which flew at 4,000 mph. He flew more than 200 aircraft models. They included jet and rocket-powered planes, helicopters and gliders. Armstrong was selected as an astronaut in 1962. His first space flight was Gemini 8, which he commanded. He was the first civilian to fly a U.S. spacecraft. With fellow astronaut David R. Scott, Armstrong performed the first docking in space, with an Agena target satellite. Less than an hour later their spacecraft began an unplanned rolling motion. After undocking, it increased to one revolution per second. One of the Gemini's 16 thrusters had stuck open because of an electrical short circuit. Armstrong used re-entry thrusters to control the capsule, and after a 30-minute struggle, it was stabilized. Flight rules required a return to Earth after use of the re-entry thrusters, so the crew members fired retrorockets that sent Gemini 8 to a contingency landing zone in the Western Pacific. The eventful flight on March 16, 1966, had taken just over 10 hours, 41 minutes. Apollo 11 lifted off on July 16, 1969, with Armstrong, Aldrin and Mike Collins aboard. Collins remained in lunar orbit in the command module while Armstrong and Aldrin descended in the lunar module they had named Eagle to their historic landing on the moon's surface. "Houston, Tranquility Base here. The Eagle has landed," Armstrong said, telling a tense and waiting Earth that men had finally reached the lunar surface. He and Aldrin spent about two hours exploring, gathering more than 50 pounds of moon rocks and setting up three scientific experiments. The next day, after 21 hours and 37 minutes on the moon, they fired Eagle's engine to begin the return to Collins and the command module. The crew returned to Earth, landing near the USS Hornet in the Pacific after a mission of just over eight days. President Richard M. Nixon was on the aircraft carrier's deck to welcome them. "This is the greatest week in the history of the world since the creation," Nixon told the three. After 16 days in quarantine to protect Earth from any returned moon germs, the crew went on U.S. and international tours. Millions greeted them as heroes. Armstrong later served as deputy associate administrator for aeronautics in the Office of Advanced Research and technology at NASA Headquarters. He resigned from the space agency in 1971. As a professor at the University of Cincinnati from 1971 to 1979, he was involved in both teaching and research. He later went into the business world. Among other positions, he served for 10 years as chairman of Computing Technologies for Aviation Inc. of Charlottes ville, Va. and later as chairman of AIL Systems Inc., an electronic systems company based in Deer Park, N.Y.
Armstrong was a fellow of the Society of Experimental Test Pilots and the Royal Aeronautical Society, and an honorary fellow of the American Institute of Aeronautics and Astronautics and the International Astronautical Federation. He was a member of the National Academy of Engineering. He served as a member of the National Commission on Space in 1985 and 1986, and in 1985 was vice chairman of the Presidential Commission on the Space Shuttle Challenger Accident. He also was chairman of the Presidential Advisory Committee for the Peace Corps from 1971 to 1973. Seventeen countries decorated Armstrong. He received many special honors, including the Presidential Medal of Freedom, the Congressional Gold Medal (see NASA feature on ceremony), the Congressional Space Medal of Honor, NASA's Ambassador of Exploration Award, the Explorers Club Medal, the Robert H. Goddard Memorial Trophy, the NASA Distinguished Service Medal, the Harmon International Aviation Trophy, the Royal Geographic Society's Gold Medal, the Federation Aeronautique Internationale's Gold Space Medal, the American Astronautical Society Flight Achievement Award, the Robert J. Collier Trophy, the AIAA Astronautics Award, the Octave Chanute Award, and the John J. Montgomery Award."